To contain and collect aluminum dust from a robot buffing operation. Hazardous aluminum dust must be collected in accordance with NFPA guidelines. A hydrotron environmental control booth wet type collector. 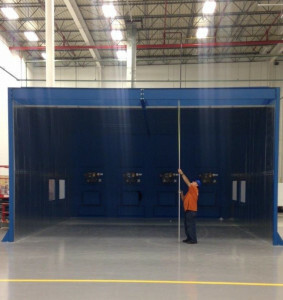 The environmental containment booth keeps the aluminum dust contained and safely collects dust through the back wall. The regain option takes any dust that may migrate forward trapped inside the booth and pushes it toward the rear where it is captured. The results have been amazing; 99% of the dust is being captured with clean air being recycled back into the plant.